The university’s Student Government Association has been springing into action, weeks before the next election, keeping up with weekly Thursday meetings. In their last university-wide meeting, senators put a special focus on the upcoming student government elections. In a university-wide bill to amend the election code of executive races, SGA President Corey Gray and Sen. Nashi Grand-Jean called for a change in winning results. In the past, running candidates had to achieve over 50 percent of the vote from the student body to win. Now, they only need to have more than the other candidates by a margin of 15 percent to claim victory. According to Gray, the bill is supposed to expedite the election process and prevent unnecessary runoffs. Last week’s meeting for only Atlanta senators, kicked off once again with frequent SGA visitor, Brekwan Oliver, a student at Georgia State. Oliver has addressed the senate before on issues of campus safety, and this time brought up concerns on the use of fake IDs. “Why do we need people thinking we’re 21 when we’re 16? It’s not something we should tolerate. We should not tolerate any undereage drinkers. We should not tolerate any underage smokers, because people might die,” Oliver told the senate. Oliver’s statements were met with agreement from the majority of the senators, but others felt the issue was a university-wide one, rather than a policy needed to be addressed by student senators. The senators also honored last week’s Florida shooting victims with a moment of silence for the deadly Valentine’s Day shooting in Marjory Stoneman Douglas High School. 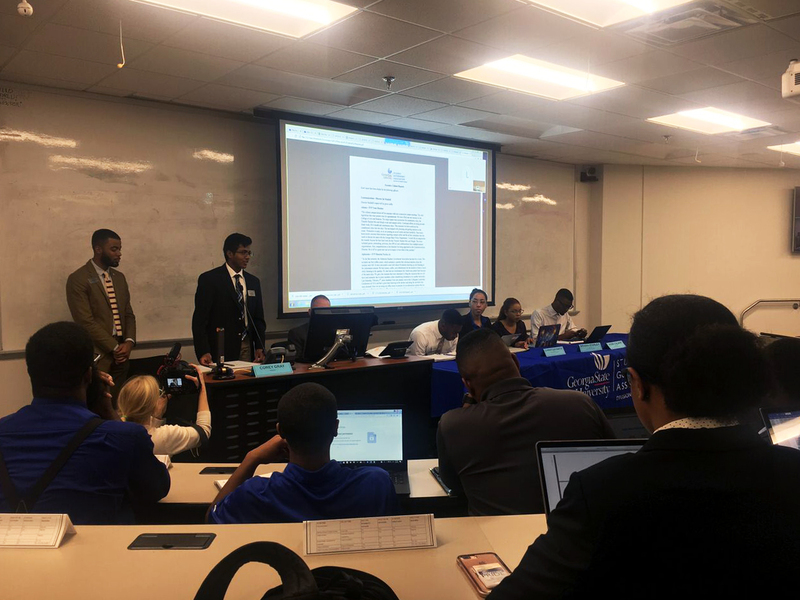 Sen. Luis Aleman encouraged all of the senators to keep an open ear to the constituency to hear any concerns they may have and to always serve the student body. Finally, the president took the floor to address the senators on the promises he made on his running platforms, and what he’d like to see in SGA’s future. Gray said that one key area he wants to focus on is creating a college environment that does not have sexual assault or harassment at the degree it does now. He said that he is working to put the phone numbers of both the sexual abuse and suicide prevention hotlines on PantherCards. Another promise that he said he hopes to achieve is free, or at least cheaper, textbooks. He did not give many details, but said he was working with administrative staff on it.